Each of the trains in the Amtrak system has some unique characteristic that sets them apart from the others. It is often something small. For instance, on the Empire Builder, which runs between Chicago and Seattle, they pride themselves on being the only ones to serve a New York Strip Steak at dinner. 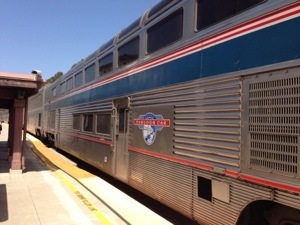 The Coast Starlight’s claim to fame is its Pacific Parlour car: a dedicated domed lounge car (Wi-Fi equipped!) strictly for use by passengers in the sleeper cars. It’s a very nice car that is half lounge, half bar and diner. The lounge half has eight soft swivel chairs plus two long inwards-facing couches fronted by small cocktail tables. The other half is made up of a bar and six dinettes, which can accommodate four passengers each. 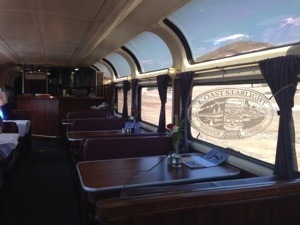 If you are in one of the sleeping cars, you have the option of either eating in the regular dining car–where you can order from the full menu–or in the Pacific Parlour car, which has a very limited lunch and dinner menu. The tradeoff for having such a limited menu is the fact that, unlike in the dining car, you don’t share your table with others but can enjoy a more intimate dining experience.